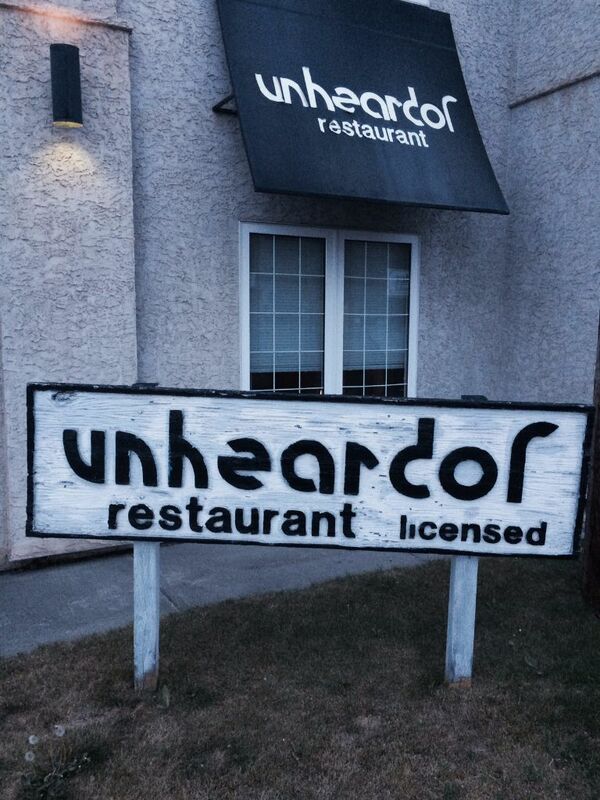 An institution on the culinary scene in Edmonton is closing its doors this month after 35 years of business. On Saturday June 13th, the last fine-dining dishes will be served at unheardof among the antiques and the fine-China tea cups. I received their newsletter announcing the news last month, and even though I knew legions of their fans would try to get in before the last bowl of their signature seafood bisque was served, I thought there was plenty of time to reserve. I tried for over a week through their online reservation system on open table, but nothing was available. I tried calling – but no luck. The phones were never answered and the message said to only leave a message if you needed to change an existing reservation. I wanted to take The Spaniard there for his first unheardof meal before it closed. Thankfully he is a patient man and was willing to humour me in my efforts to get us a table. On Tuesday last week we showed up at 6:15, asking if there was a cancellation or if we could come back and take the last table of the night. Nothing was available. The next day, I checked my pride at the door and tried again. This time, we were in luck as a table from the early dining crowd has just turned and we could get in. I almost skipped past the vintage furniture to our table that was guarded by a mallard. We were there for the d’hote menu – a $70 option which allows diners to select an appetizer, main course and dessert which comes with the daily sorbet. The Spaniard was excited to see butter on the table because that meant there was bread. To begin he ordered the seafood bisque which is poured table side over black tiger shrimp, Canadian scallop, king crab. Sopping up every last droplet with his basket of bread, he was an instant fan of unheardof. I opted for the carpaccio of half New Zealand venison and swordfish which was sliced thin and seasoned beautifully. Next up we shared the Morello Cherry Duck Breast and the Atlantic halibut fillet coasted with a pumpkin and sunflower seed flour sautéed and served over caper sauce. The real star of the night was dessert. The Spaniard opted for the gluten-filled house favourite Turtle Tart. He said the pecan filled phyllo topped with caramel and whipped cream, chocolate and caramel sauces was one of best desserts he’s had in Edmonton. While I am traditionally a créme brulé girl, I ordered that on my last visit to unheardof and wanted to try something different. I’m not a big fan of chocolate, but the toasted chocolate almond tart served with amaretto sauce was rich and delicious. In the end, I was happy that we tried our luck at last minute reservation so we could dine at unheardof together before they close. The trick could work for a few more if you’re willing to take the risk of being turned away. The restaurant may be entirely booked up until June 13th – but a reservation, an opening, a table can always pop up. If you don’t have a chance to get in to unheardof before they close next week, you can still stop by for take-away containers of soup. We were told that Chef Lynn Heard will continue to make her legendary seafood bisque available possibly at a farmer’s market. Contact info@unheardof.com for more information.